To Repel Ticks, Try Spraying Your Clothes With A Pesticide Called Permethrin : Shots - Health News Just in time for summer hikes and outdoor play, a study finds that the ticks that often convey Lyme disease become unable to bite, and soon die, after exposure to clothing treated with permethrin. When ticks come into contact with clothing sprayed with permethrin, research shows, they quickly become incapacitated and are unable to bite. There's new evidence to support a decades-old strategy for preventing the tick bites that lead to all sorts of nasty diseases, including Lyme disease and Rocky Mountain spotted fever. 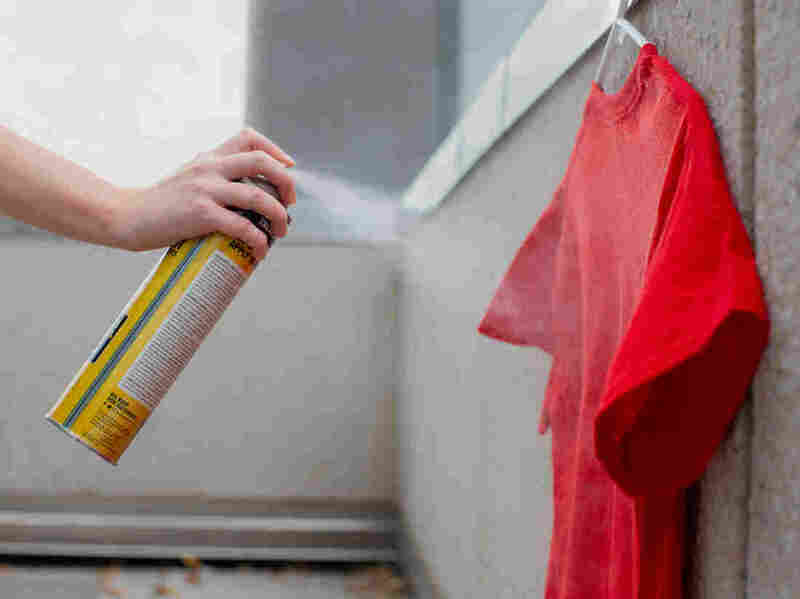 The remedy involves spraying your clothing with permethrin — a pesticide that's chemically similar to extracts of the flowering chrysanthemum plant. Back in the 1980s, the U.S. military conducted several tests on a synthetic version of the plant-derived pesticide. When it was shown to be effective in preventing the bites of insects and ticks, the military began to purchase uniforms for soldiers that are factory-treated with permethrin. Now, many outdoor enthusiasts are converts, too. "I love being outside — whether it's hiking, biking or climbing," says Danny Quinteros, who lives in Washington, D.C., and works at REI. Quinteros is planning a hike of the Appalachian Trail, which cuts through many tick-infested areas. And because of the rise in tick-borne diseases, permethrin has become part of his protection routine. He takes a can and sprays it on a T-shirt. "You want to stay back about 6 to 8 inches away from the clothing," he says. He applies an even coat, then flips the T-shirt over to spray the back. In addition to treating his clothes with permethrin, Quinteros wears a DEET-based repellent to cover his exposed skin when he's outdoors. Together, he says, these two strategies are very effective. There's scientific evidence to back up Quinteros' observations. "There are several studies that provide pretty compelling evidence that wearing permethrin-treated clothing has the potential to reduce tick bites," says Neeta Connally, a medical entomologist who oversees the Tickborne Disease Prevention Lab at Western Connecticut State University. The most recent study, published in May in the Journal of Medical Entomology, comes from researchers at the Centers for Disease Control and Prevention. The scientists let loose different species of ticks on a bit of treated cloth from each sample — a piece of cloth the size of a playing card. "We wanted to see how long [the ticks would] have to be in contact with the clothing to be incapacitated and die," says Lars Eisen, a research entomologist for the CDC in Fort Collins, Colo., and one of the study's authors. The ticks quickly become irritated after being exposed to the pesticide, Eisen says. "They essentially start flipping backwards and start rolling off the treated clothing," he says. The black-legged tick — also known as the deer tick — which can transmit the bacteria that cause Lyme disease, was one of the species tested. When black-legged nymphs (young ticks that are no bigger than a poppy seed) came into contact with the treated clothing, it took them "less than a minute" to receive a dose of permethrin that killed them, Eisen says. And even though the ticks don't die instantly, the permethrin quickly incapacitates them so they're unable to bite. So, if permethrin-treated clothing is so effective, why don't more people use it? For example, in one Lyme prevention study published in 2009 that Connally and her team conducted in Connecticut, less than 1 percent of study participants said they ever wear treated clothing. And even though awareness is growing, she says, a more recent survey "found that many respondents were uncertain about the effectiveness and safety of treated clothing." Permethrin has been registered with the Environmental Protection Agency since 1979, and the EPA periodically re-evaluates it. It's an EPA-registered product, "which means it must be studied for safety," Connally says. According to the EPA website, "All exposure scenarios showed that permethrin factory-treated clothing is unlikely to pose any significant immediate or long-term hazard to people wearing the clothing." Using permethrin spray according to directions to treat your own clothes should also pose little risk, the agency says. The National Pesticide Information Center notes that some people who inadvertently get the insecticide spray on their skin may experience temporary tingling, redness or irritation at that site, but not serious symptoms. Permethrin lotions and creams are also routinely used to treat head lice and scabies in people 2 months of age and older. "I absolutely wear permethrin-treated clothing," say Connally, who has no financial ties to makers of permethrin or the treated clothes. And she says many of the researchers in her lab wear treated overalls to protect themselves while doing research. "When I think of the potentially serious illnesses that my family members or I could get from a single tick bite, I feel very comfortable wearing treated clothing," she says.